In Islam, when we want to thank someone, we don’t just say “thank you.” We say JazakAllah. But have we ever stopped to ponder the beauty of this? JazakAllah isn’t just your average thanks. It’s a prayer! JazakAllah means “May Allah reward you.” Whenever someone helps us or gives us something, we are deeply grateful. However, to show our gratitude, we go deeper than ourselves. We go to Allah (SWT). We ask Allah (SWT) to reward this person for what they did for us. It just takes a second, but with this small prayer, we give them something greater than this world – we ask Allah (SWT) to give them a reward that will stay with them in the Hereafter. Come up with a list of 10 people to thank, and show them your appreciation by writing them thank you notes. Thank your mother for preparing your food. Thank your dad for taking you to the park. Thank your teacher for being so patient with you. Thank your neighbor for baking cookies for you. Thank your friend for being kind to you. And most importantly, make a small prayer for each of them – say JAZAKALLAH. Ask Allah (SWT) to reward them for everything that they do for you. To download the pictured “JazakAllah” cards, click here! 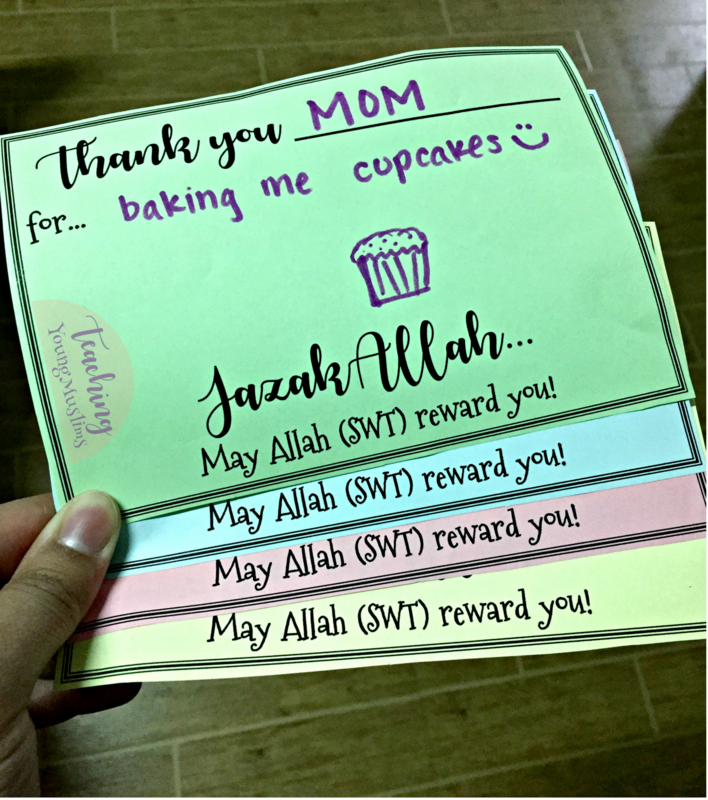 What was the most creative thing your kids thought of to thank someone and say JazakAllah for? I’d love to hear – leave me a comment below!